When @rivanyri started singing, she nearly sent me down the aisle in a crying mess. But Senfuab kept me rooted with the drumming. When Tyler and I first got engaged, the only wedding detail I was sure of was my entrance. I did it! 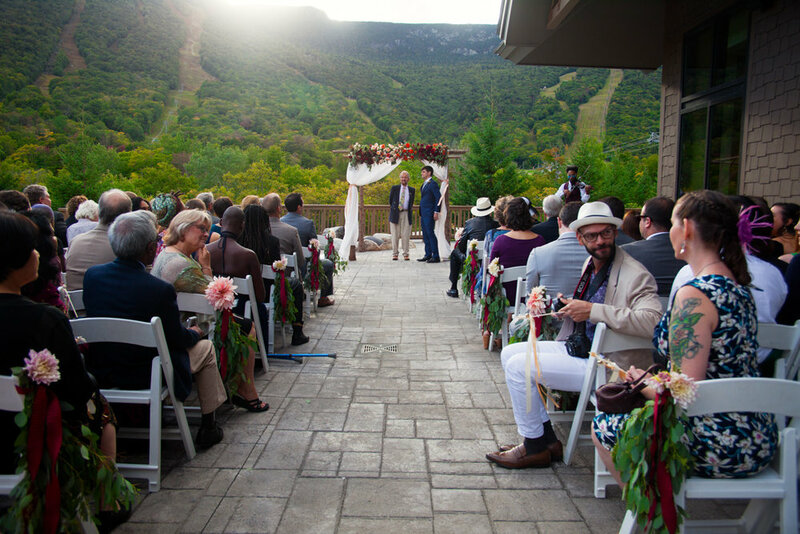 I walked down the aisle barefoot to drumming surrounded by mountains. All my ancestors were with me that day. Shining bright with the sun facing us. And in my heart. This magical day wouldn't have been the same without my wonderful talented friends, big family, and of course, the love of my life. 9.11.16 • #PaolaLovesTyler 🎈#elevenyearslater #PaolaAndTyler • Thank you @hardhittinharry for this clip! After communing with my great grandmother, I knew that I needed to wear a headwrap. It is how I wanted my children, and their children, to remember me. I decided to layer three wraps; I wanted them to sit tall on my head and reflect how powerful and beautiful the day felt. 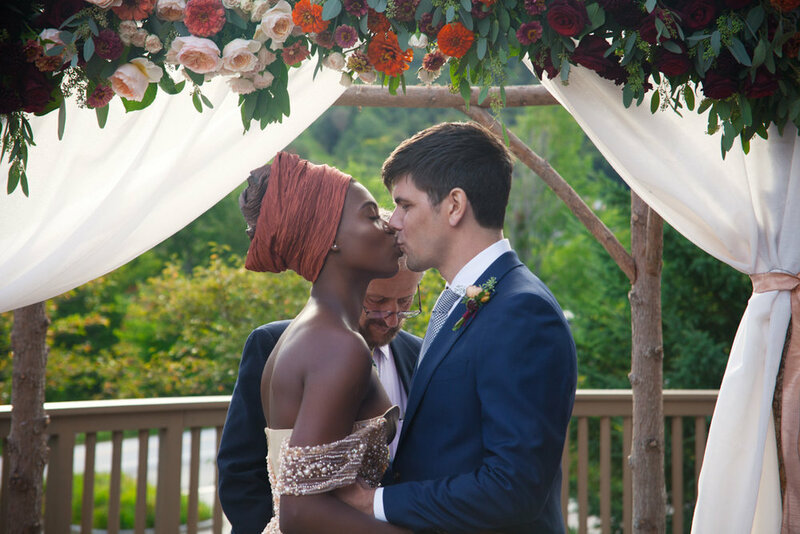 I wore the headwrap throughout the entire ceremony, and when I look back at all of the photos, I feel moved knowing that this is how the day will be remembered. When I heard Riva’s voice, I fought back tears as I quickly removed my heels using my Dad’s arm for support. “At last…” Her voice travelled down the aisle and picked me up as if I was weightless. I felt like a balloon; as if I could float wherever the wind took me. Then the drumming began, and I walked down the aisle barefoot in a flowy dress, custom-made for me. 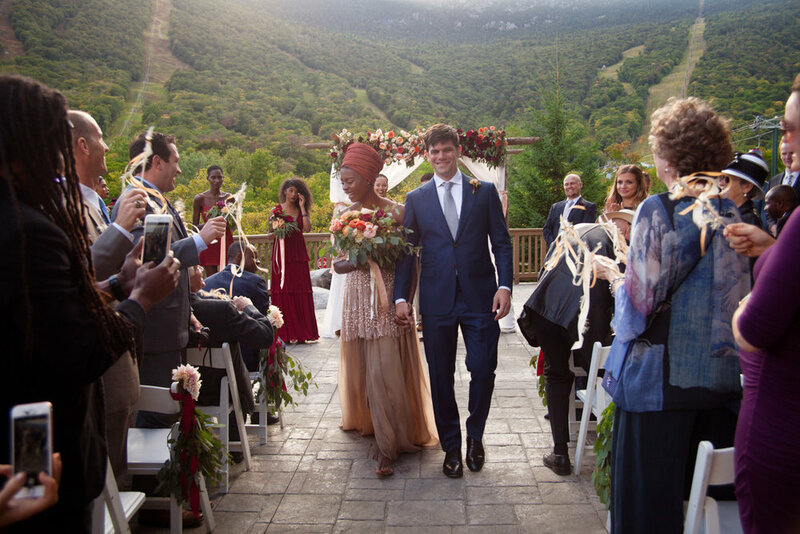 For me, the most important part of our wedding was the experience. Comfort is always key to everything that I do. I wanted my dress to be flowy and fun because I like to eat and move. 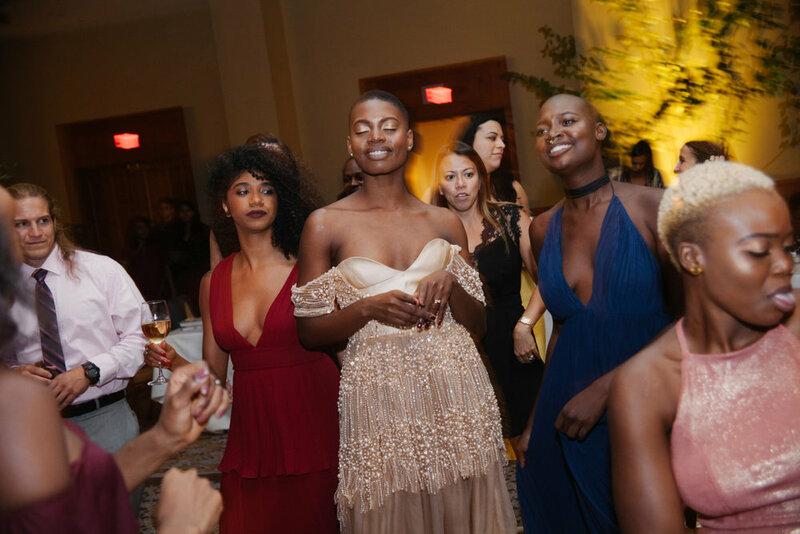 I opted to remove my headwrap for the reception to show my short buzz cut and allow myself to dance without restriction. I only provided my bridesmaids with a color scheme and requested that they choose their own dresses, that way everyone could purchase something that they felt beautiful in, and that was within their budget. I chose the venue because it was a great vacation destination with plenty of on-site and offsite activities - my girls and I hung out at the spa, and my dad and a few friends even went ziplining! I wanted a venue where different people from different places could come together and still have a great time. In the end, I wanted a fun party where my husband and I would be surrounded by the people closest to us. And after I lost my voice for three days and one of my toes was numb for a week from dancing all night, I realized that I had achieved exactly what I envisioned. We had a non-traditional, non-religious wedding. I did not have a maid of honor. Tyler and I wrote the entire ceremony and our individual vows. For cocktail hour, our amuse-bouches offered a fusion of our cultures that included pikliz (a Haitian condiment that pretty much goes with everything) and an array of Vermont cheeses. 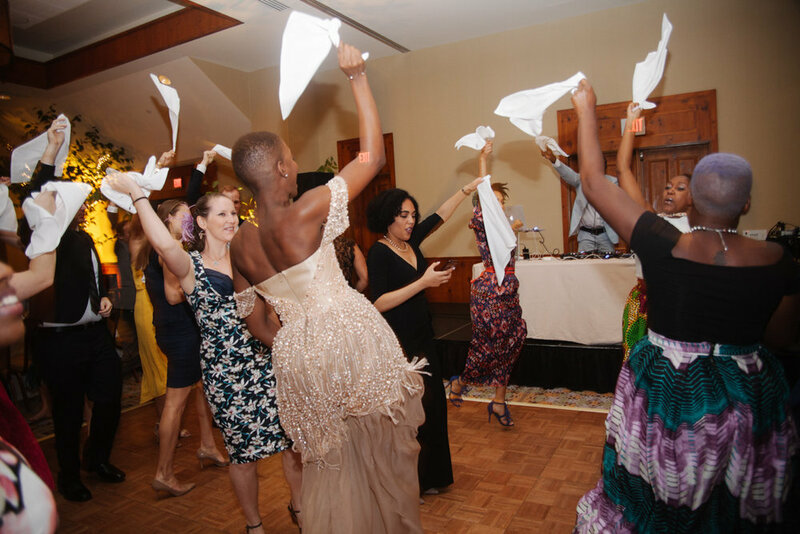 With the help of one of my dear friends, Nyri, I named our reception tables after ten Haitian loas: Papa Loko, Erzulie, Legba, Simbi, Ogou, Marasa, Azakamede, Danbala, La Sirène, and Gran Bwa. We did not have a wedding cake. Instead we opted for Ben and Jerry’s ice cream since their factory was not very far away! Getting ready. “Shhhhhh… Listen to the wind. Just relax. I got you,” Lanea, my go-to makeup artist calmly said as I sat in her chair. I looked at the mountains. The skies were clearing. Everyone who came into the room to ask me as question, she would send away. She told me I needed this time for myself, and I trusted her. The girls and I shared some food and champagne and had a mini-party as we were getting ready. Earlier in the morning, we had soaked in the hot tub, and then relaxed in the steam room. That’s where I timidly asked Riva to sing at my ceremony. The idea came to me when I woke up as I looked at the clouds. I told Ania, and she pushed me to ask her. I was so grateful when she agreed on such short notice. I loved watching Tyler’s mom and my mom get ready as well. I loved how both trusted me with their makeup and their dresses. Walking down the aisle. There’s no true way to really explain how I felt in that moment. The drumming took control of my feet. My toes gripped the ground. I stared at all of the happy faces looking back at me. My husband stood under the arbor facing the sun, his eyes smiling. By the time I reached the middle, Jessica, one of my bridesmaids could no longer hold back her tears. I held on tighter to my dad. And finally I was there. Delighted to finally be there. The first dance. Tyler and I swayed to Sade’s By Your Side with a Fela Kuti mix. I closed my eyes. When I reopened, the bridesmaids had joined in. Then the entire party. Phyllisia Ross’s impromptu performance during my reception. I am just so lucky to be surrounded by the most talented, supportive friends who go along with my random ideas when I ask them. Dancing with my dad. I’m not sure we had ever danced together before! It was such a pleasure to watch him dance! ALL NIGHT. What?! Dancing with Tyler’s family and close friends. It was so special to see everyone dancing to Haitian music. I took mercy on no one! If we made eye contact, I grabbed you and pulled you onto the dance floor. The music was fantastic. DJ Harry satisfied everyone’s needs with a nice mix of Konpa, Rasin (Haitian roots), Soka, Afrobeats, and various popular American hits. 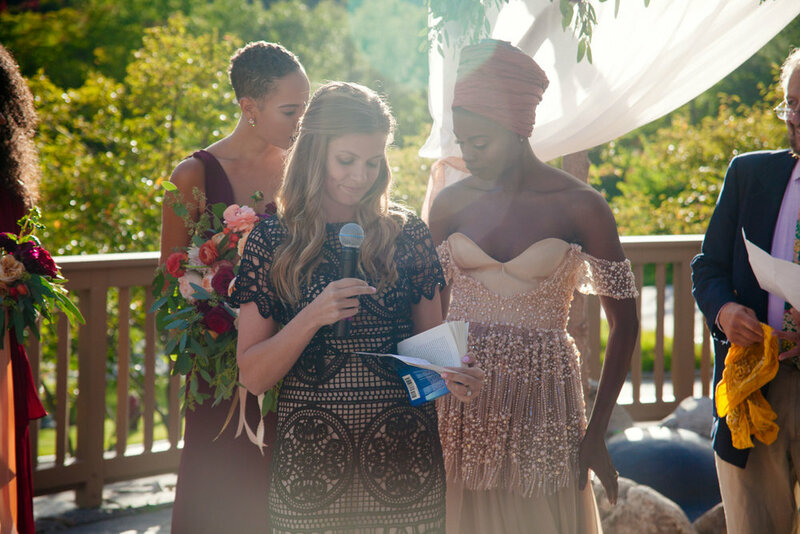 My wedding could not have been the same without all of the amazing vendors I hired for the big day! They made it so easy for me to plan everything remotely. My dress designer saved me! I reached out to her just a month before my wedding after my agreement with another designer fell through. I'm so grateful for all of these individuals and small businesses who were part of the most beautiful day of my life. (View the full list below). 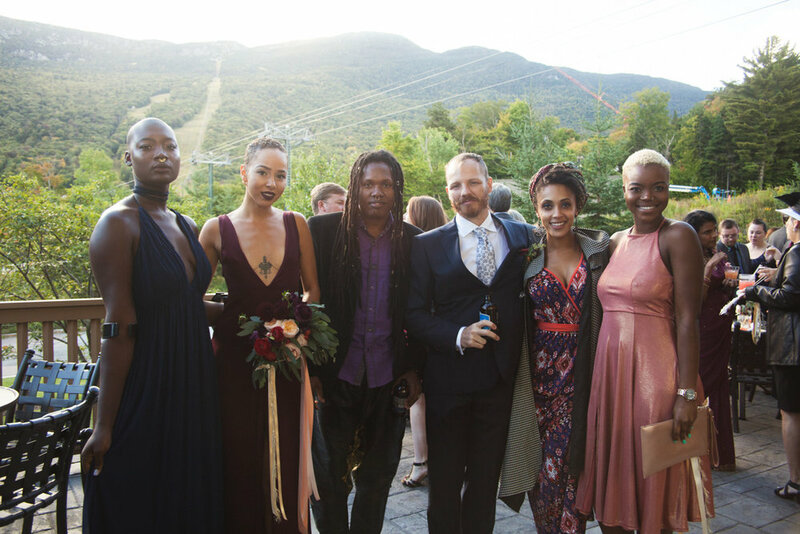 Bridesmaids: Riva Nyri Precil, Abby Omoruyi, Jessica Faria, Ania Charlot, Soukena Jn Jacques.